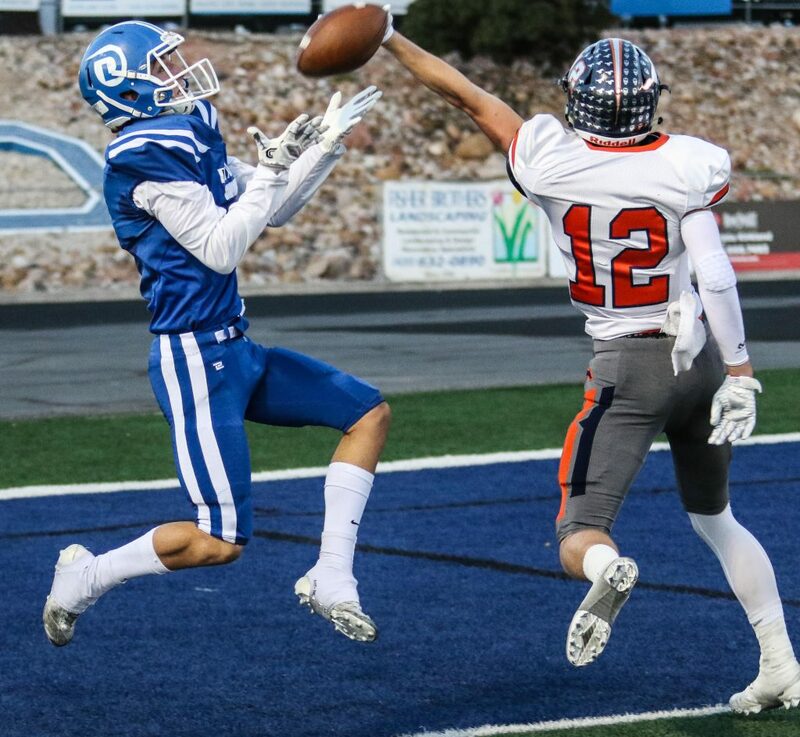 ST. GEORGE – Without star Hobbs Nyberg and with a banged up Jacob Barben at quarterback, it all came down to one play for the Dixie Flyers Friday night in the 4A quarterfinals against Mountain Crest. 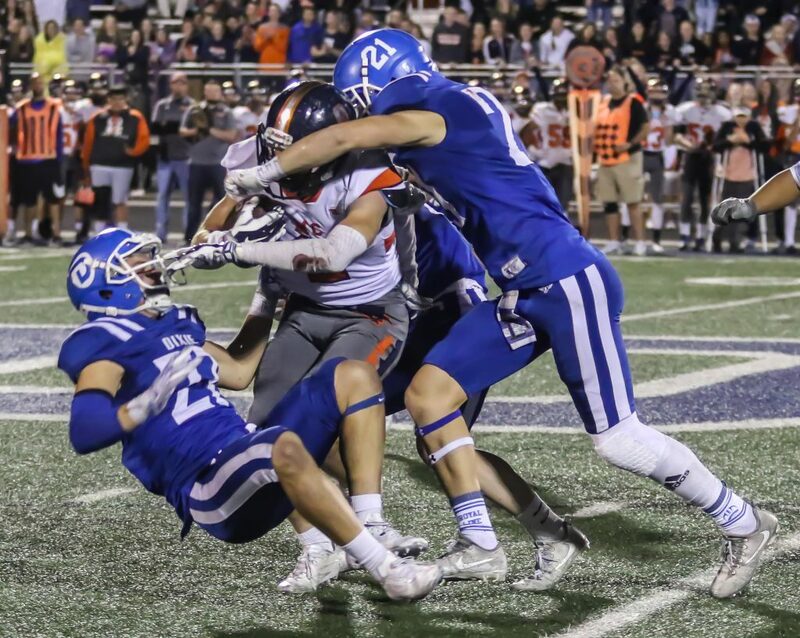 Trailing 18-17 and facing a fourth-and-5 at the Mountain Crest 37-yard line with one minute remaining on the clock, Dixie needed to reach the 32 to extend the drive and, in parallel, extend its season. The ball was snapped to quarterback Barben in the shotgun. He looked left, and then right. The Mustang defense then flushed him out of the pocket to the left. Barben finally tucked the ball and sprinted to the Mountain Crest sideline. He was hammered to the turf just 1 yard short of the distance needed, ending the Flyers drive, and season. The Mustangs took over and kneeled out the clock to record an 18-17 road win against the Region 9 champs. 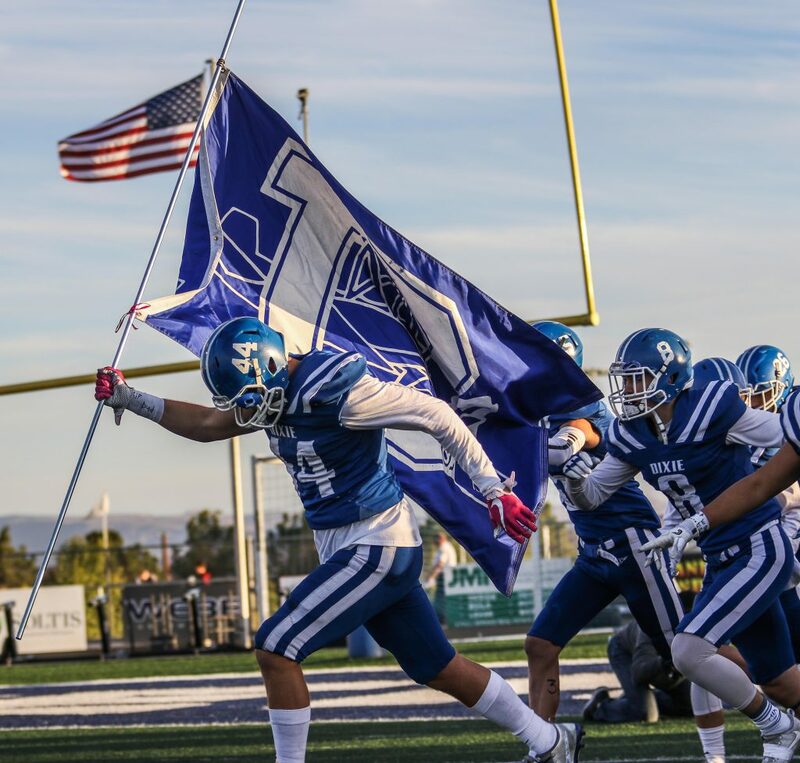 With the loss, Dixie joined the other two Region 9 teams, Pine View and Desert Hills, in defeat, and for the first time in more than a decade, there will not be a Region 9 team in the state semifinals. 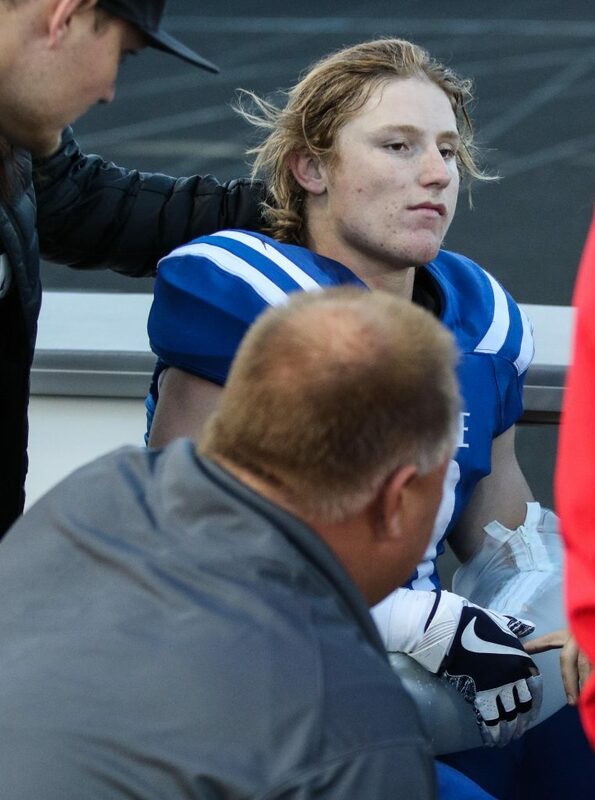 Barben was still on the field after breaking his right collarbone in the second quarter. The same could not be said for his teammate and the probable Region 9 MVP, Hobbs Nyberg. 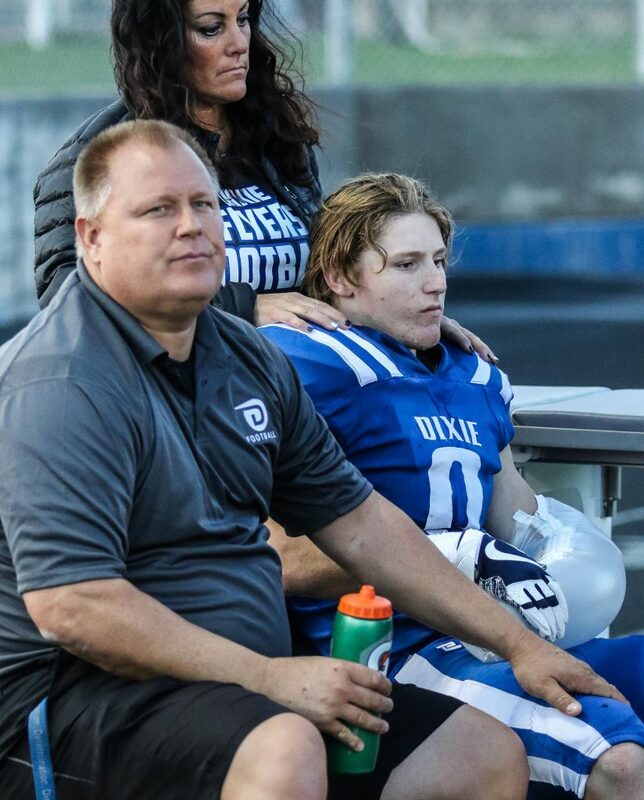 the senior running back/receiver was injured in the first quarter when one of his offensive lineman fell on his arm, breaking it. The Mustangs were able to get on the scoreboard first. Two big plays netted 65 yards and the length of the drive. Mustang quarterback Brady Hall found running back Beau Robinson on a route out of the backfield up the middle of the field for a 45-yard catch-and-run. 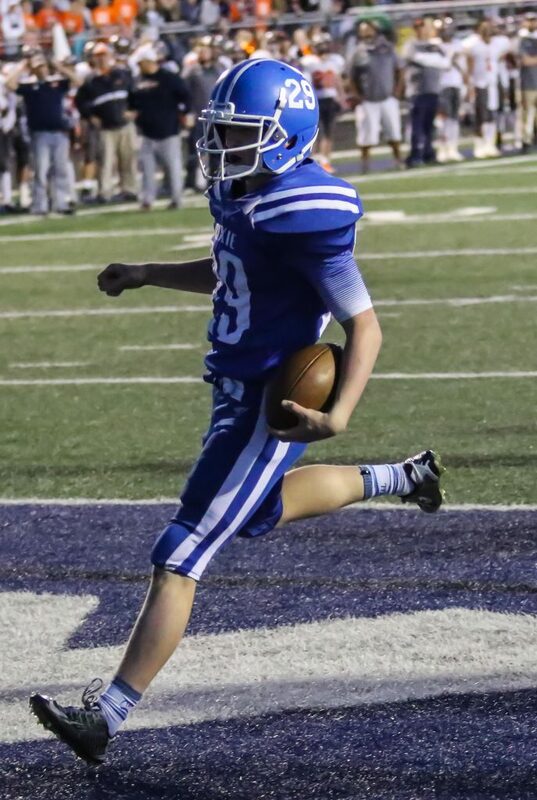 The missed extra point gave Mountain Crest a 6-0 lead. One of the biggest plays of the game occurred on Dixie’s next possession. Barben was hit just as he handed the ball to Nyberg, causing a fumble. There was a scrum for the ball and the Mustangs came up with it. But even worse for the Flyers: Nyberg came off the field under his own power, but was clearly in distress. The Flyers’ offensive leader was out of the game. The Dixie defense came up big and held the Mustangs to a field goal with 1:09 left in the first quarter. Mountain Crest led 9-0. The Mustangs then forced the Flyers to a three-and-out. 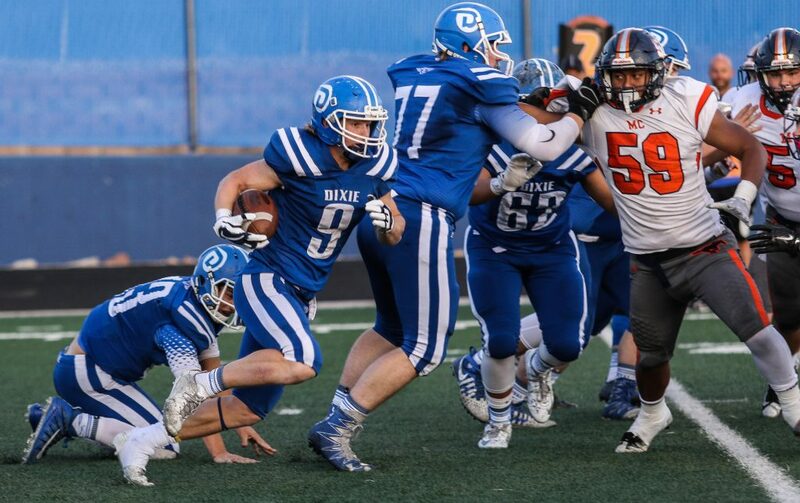 The Dixie defense came up big and sacked quarterback Hall twice to force a Mustang punt. Punter Eli Wells took the snap and punted quickly to avoid the quick Dixie rush. The Dixie rush had forced the up-man back into Wells as he kicked, however. Wells’ punt hit the up-man square in the back and caromed backward into Wells’ hands. 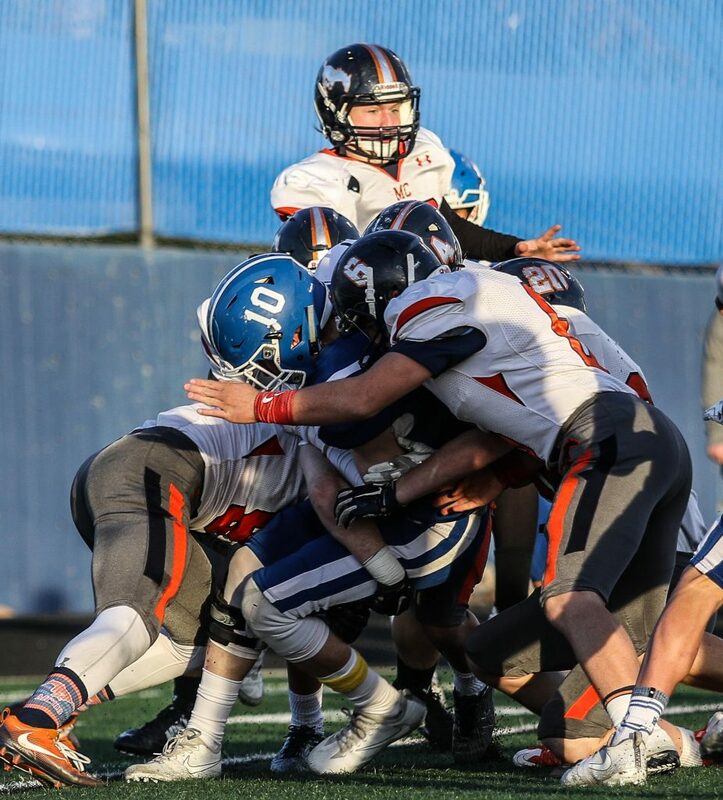 The Flyers made the tackle and put their offense in great field position at the 21-yard line of the Mustangs. Barben took advantage quickly with a 21-yard fade to receiver Payden Harrah for the touchdown. Dixie cut the lead to 9-7 with 9:39 left in the half. On the ensuing possession, Flyer safety Matt Kitchen intercepted Hall’s pass and returned the ball to midfield. Fourteen plays later, running back Preston Moore ran left off tackle for the 3-yard touchdown to give Dixie its first lead, 14-9. 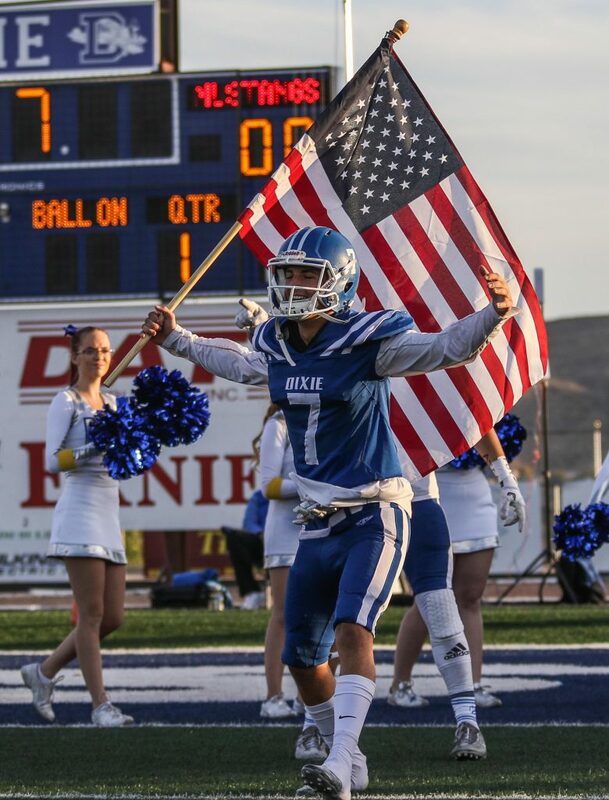 Dixie took that lead into the locker room. 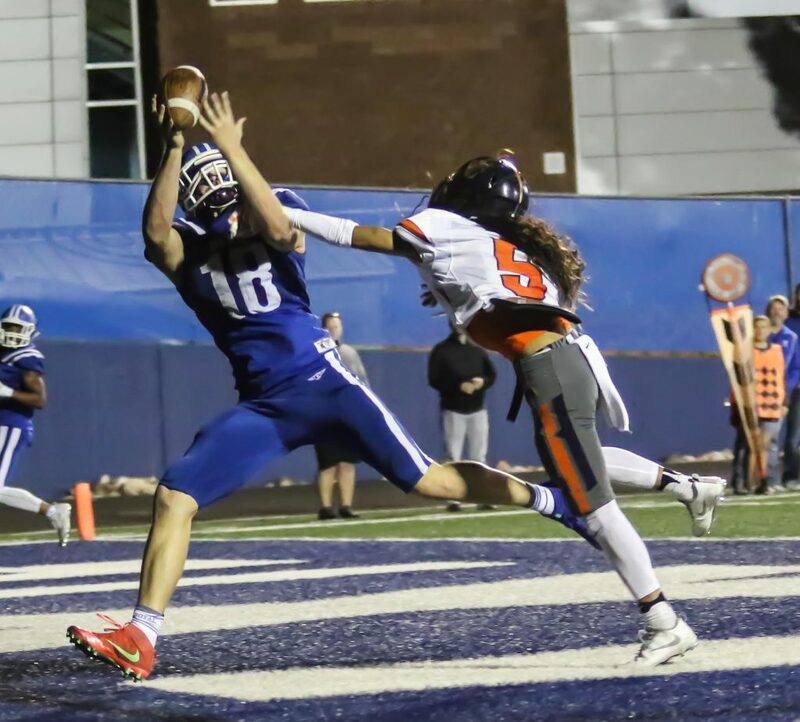 With Nyberg out of the game, wide receiver Payden Harrah saw most of Barben’s targets in the first half, pulling in 10 catches for 79 yards and a touchdown. However, at the half the Mustangs made an adjustment and Harrah saw double-coverage most of the remainder of the night. The game became a defensive contest in the second half. 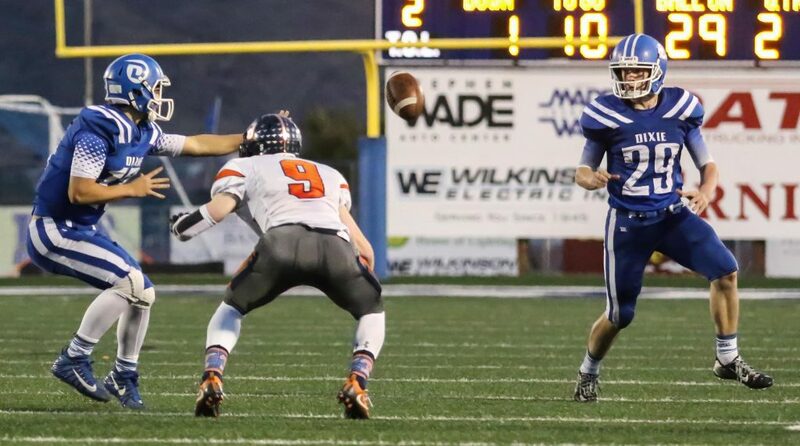 The teams traded punts twice before Mountain Crest put some points on the board. Robinson got his second touchdown of the night on a 2-yard plunge with 4:43 left in the third. The Mustangs’ 2-point conversion attempt came up short and the lead was 15-14. Dixie answered back quickly with a nine-play drive that covered 50 yards and ended with a Myles Keenan 21-yard field goal to give the Flyers a 17-15 lead with 1:56 remaining in the third. 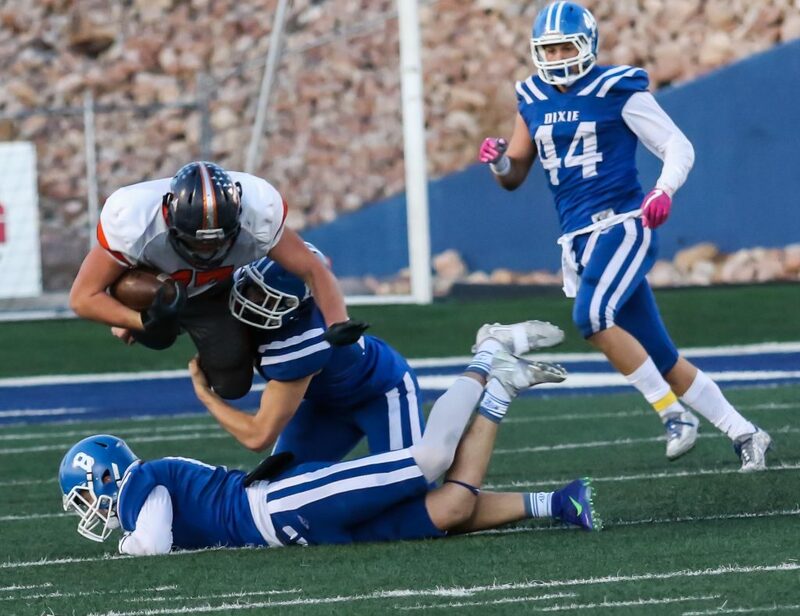 The Mustangs came up empty when Wells’ 36-yard field goal was wide left on Mountain Crest’s next drive. 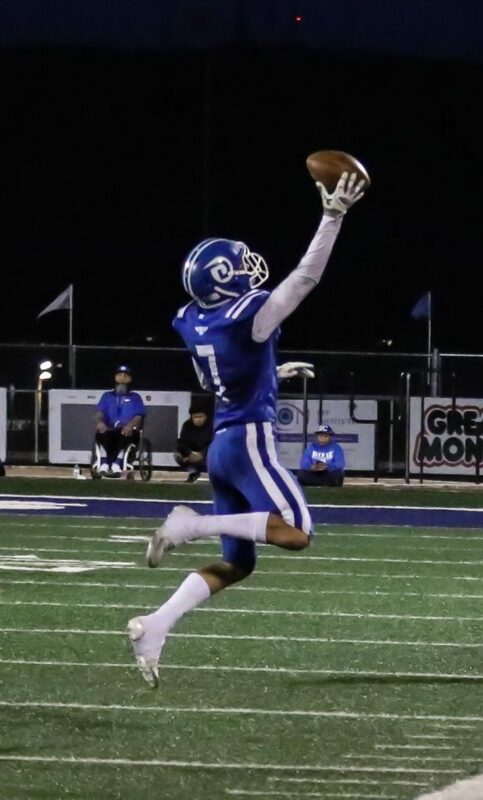 But Dixie shortly turned the ball over with an interception to set up the Mustangs again with a short field at the Flyer 24-yard line. 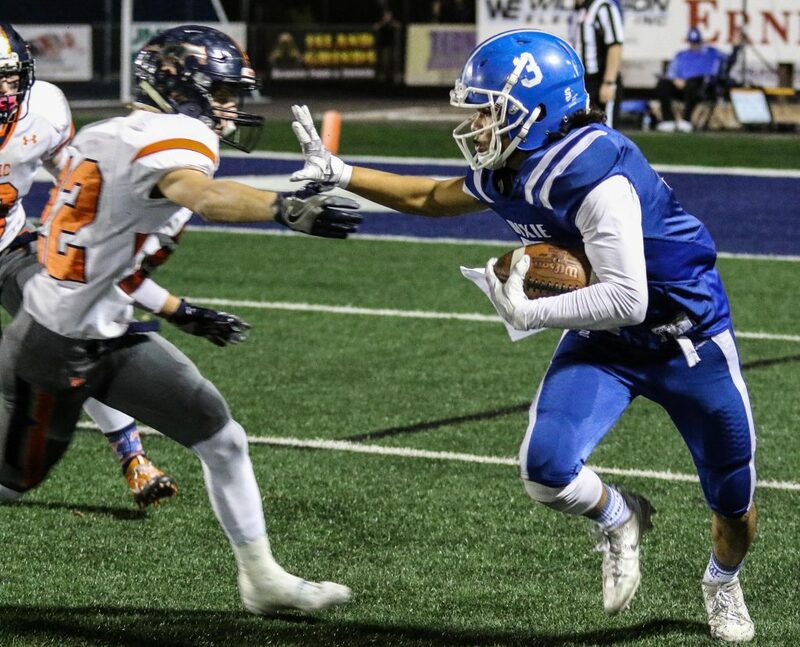 The Dixie D came up big again by keeping Mountain Crest out of the end zone, but this time Wells connected from 20 yards out to put the Mustangs up for good 18-17. 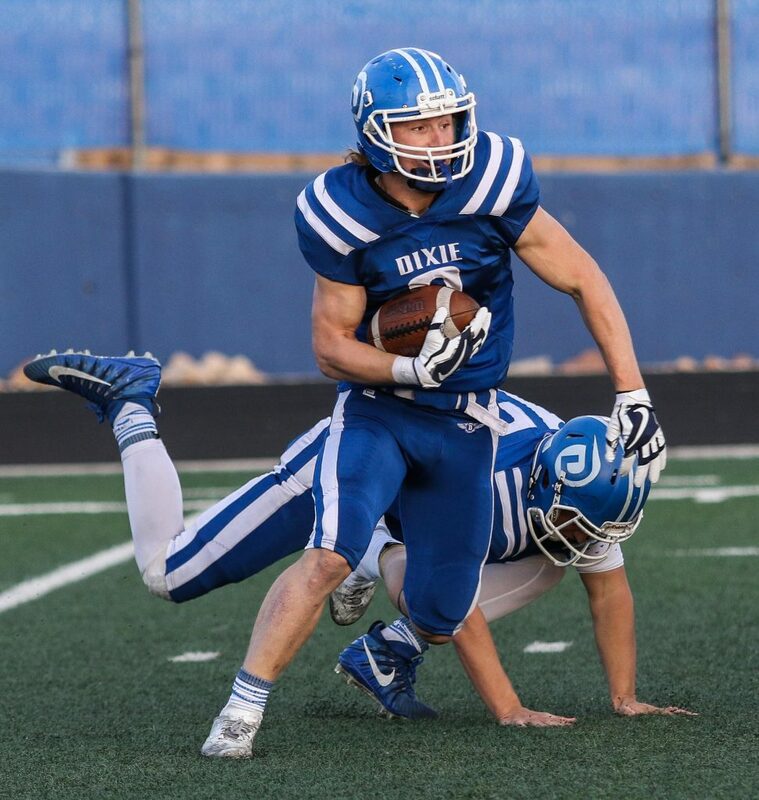 Dixie’s high-powered offense was held to 216 total yards (150 passing, 66 rushing). 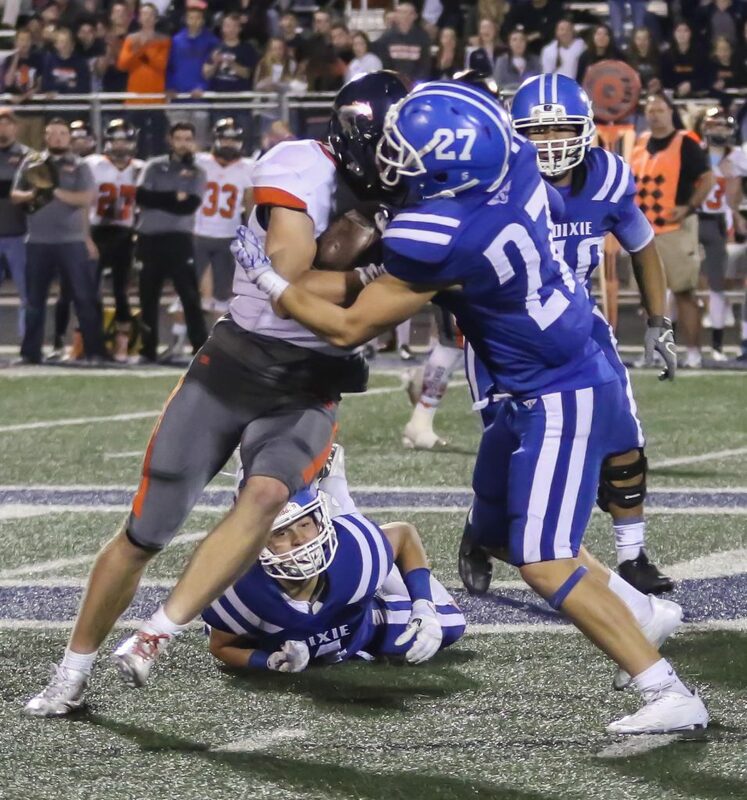 The Flyers held Mountain Crest to 264 yards. Individually for the Flyers, Harrah had 11 catches for 89 yards. Barben connected on 20 of 46 passes for 150 yards. Barben also led the team with 30 yards rushing. For the Mustangs, Hall completed 8 of 22 for 152 yards. He also led the team in rushing with 70 yards on 24 carries. The Mustangs move to 11-1 and will face Stansbury next Friday in the 4A semifinals. 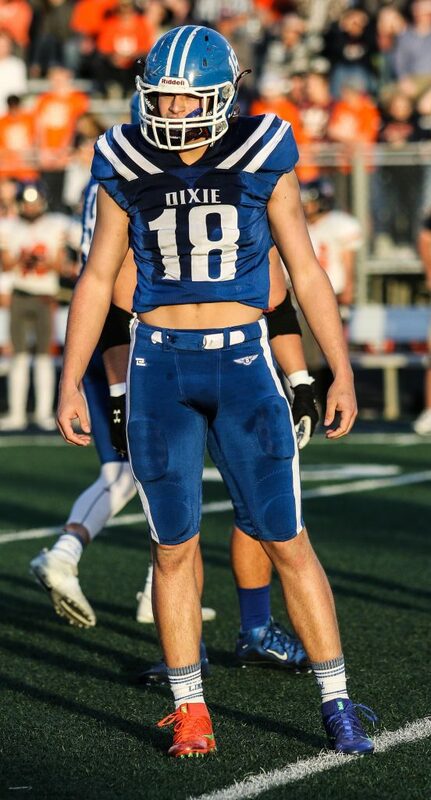 Dixie falls to 10-2 and completes its season. 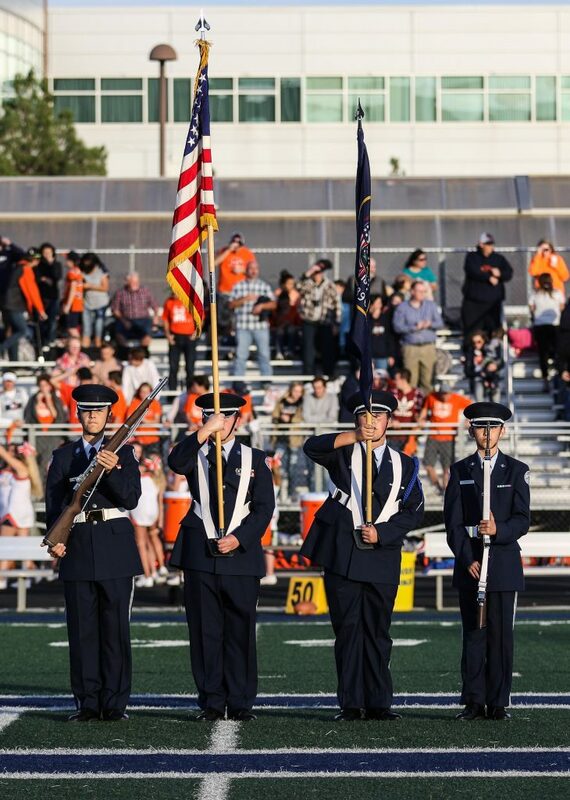 Mountain Crest vs. Stansbury, 6 p.m.